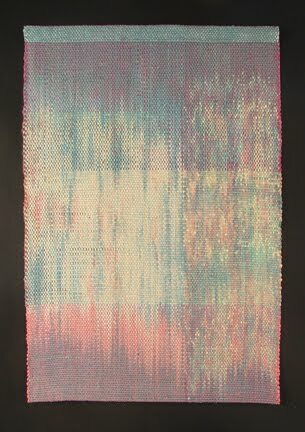 Cotton; hand dyed shibori warp, hand dyed weft, hand woven; 50" x 76"
Cotton: shibori warp, ikat weft; hand dyed and hand woven. 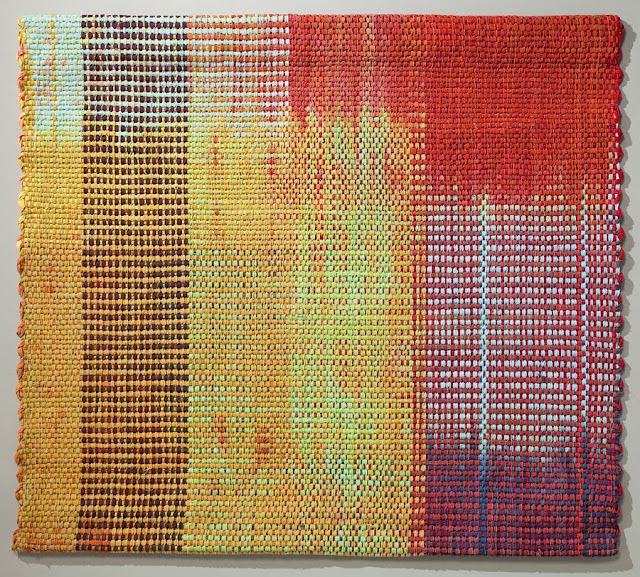 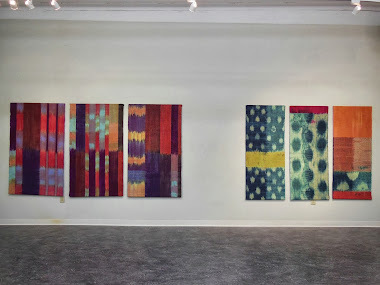 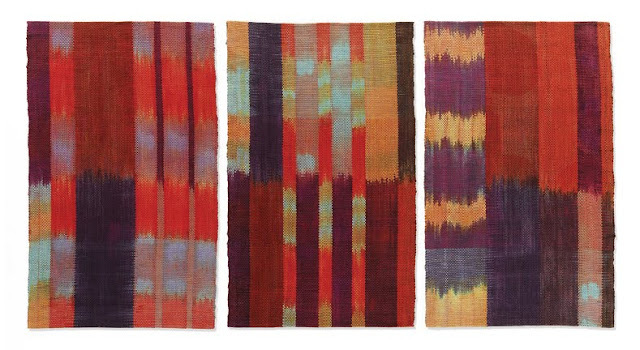 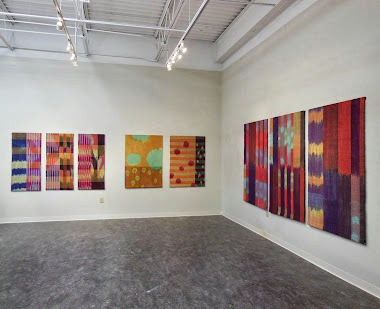 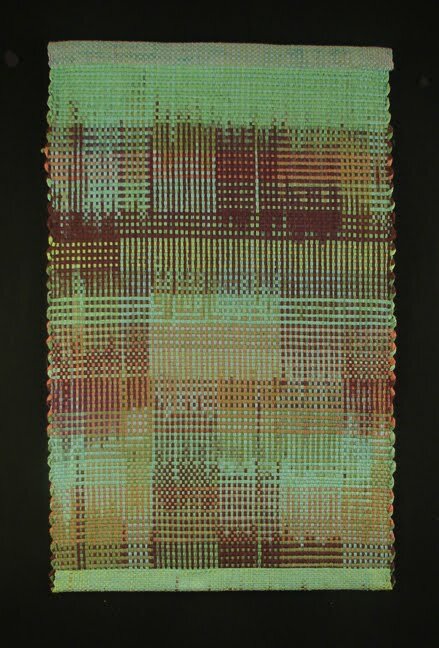 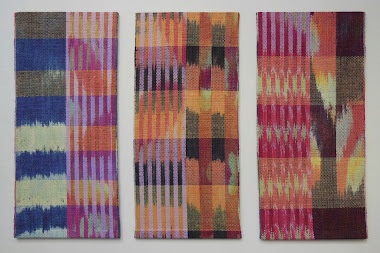 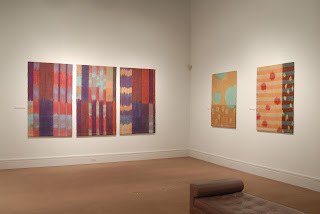 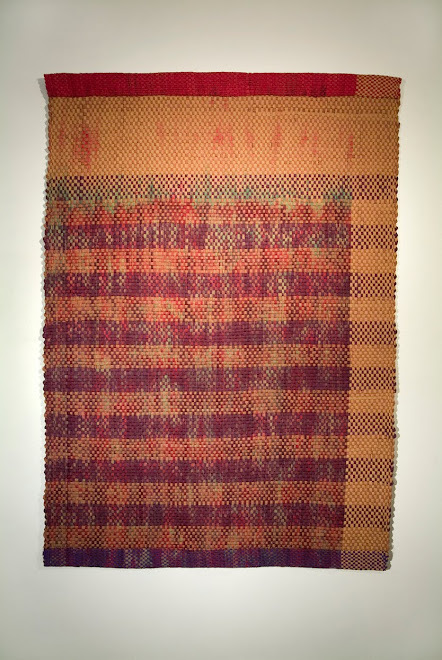 64" x 134"
Cotton: hand dyed shibori warp, hand dyed ikat weft, hand woven; 65.5" x 85"
Cotton; two panels; hand dyed, ikat warp and weft;, hand woven; 56" x 42"
Cotton; ikat warp and weft, hand dyed and hand woven; 28" x 31.5"
Cotton; ikat warp and weft, hand dyed and hand woven; 28" x 31"
Cotton; hand dyed ikat warp and weft, hand woven; 51" x 31"
Cotton; hand dyed warp and weft ikat, hand woven; 48" x 31"
Cotton; hand dyed warp and weft ikat, hand woven; 52" x 64"
Cotton; hand dyed, ikat warp, hand woven; 47" x 30.5"
Cotton; hand dyed, warp and weft ikat, hand woven; 38" x 64"
Cotton; hand dyed, warp and weft ikat; 62" x 35"
Cotton; hand dyed, warp and weft ikat, 64" x 19.5"
Cotton; hand dyed, warp ikat, hand woven; 48" x 35"
I play with color and pattern to create the illusion of deep, layered and contemplative spaces in my weavings. 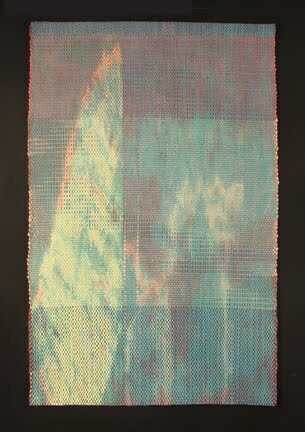 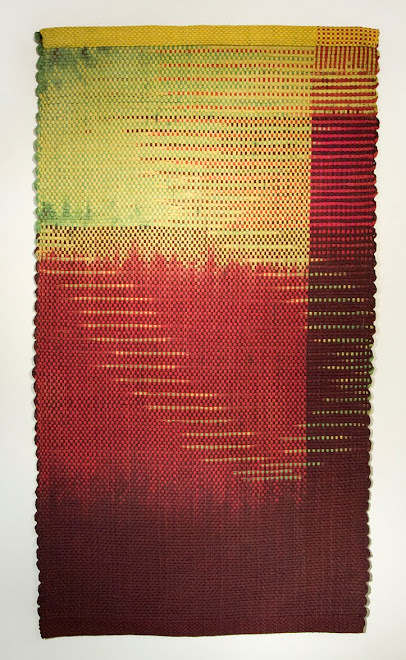 Warp and weft elements intersect to produce subtle and/or dramatic forms and contrasts. 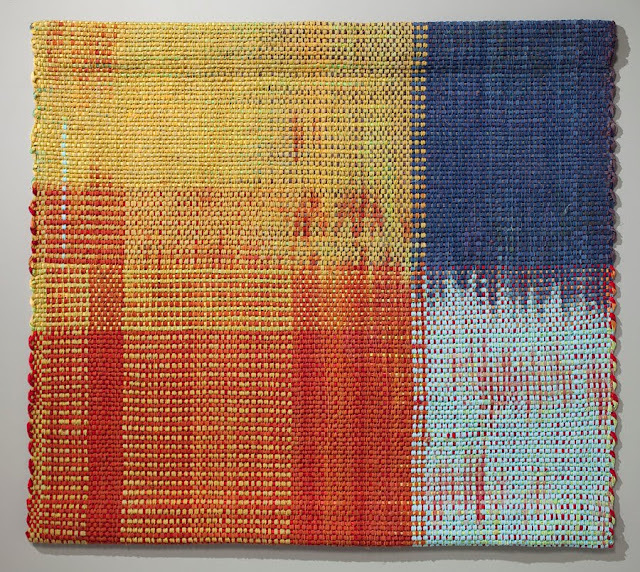 There is a planned outcome, but it can also be challenged or distorted by the warp and weft under tension. 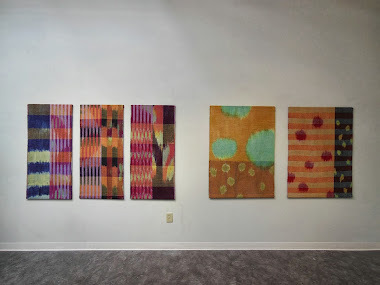 I draw inspiration from historic and contemporary textiles from many cultures, as well as from rhythms in the landscape, architectural structures, and found object compositions. 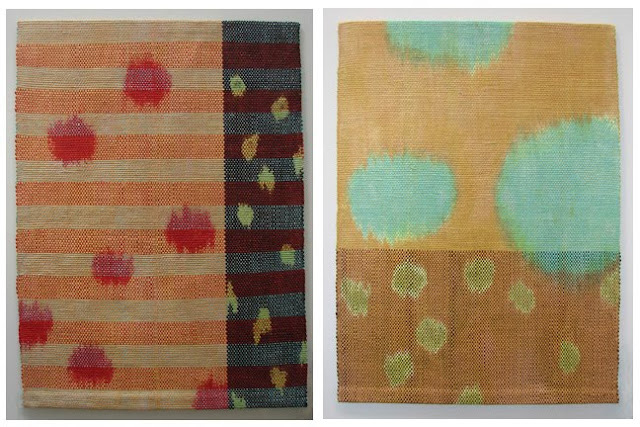 The splendid patterns and vibrant colors of the ikat fabrics and embroideries from Uzbekistan are most recent influence on my work. 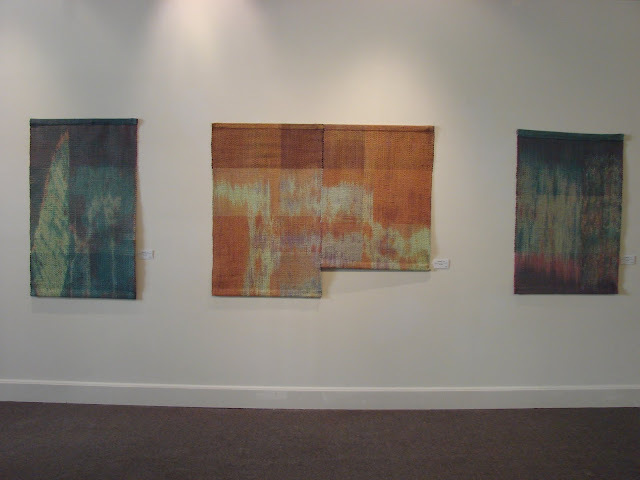 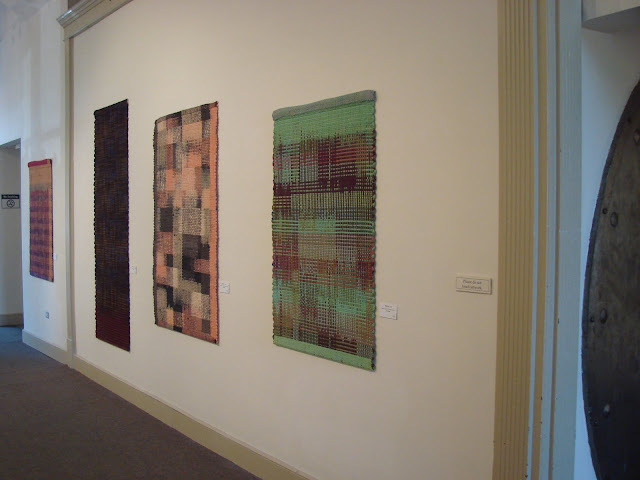 BIO I have been weaving since 1975, in and around various administrative and curatorial positions with non-profit arts organizations, universities and galleries in Vermont, Maine and North Carolina. 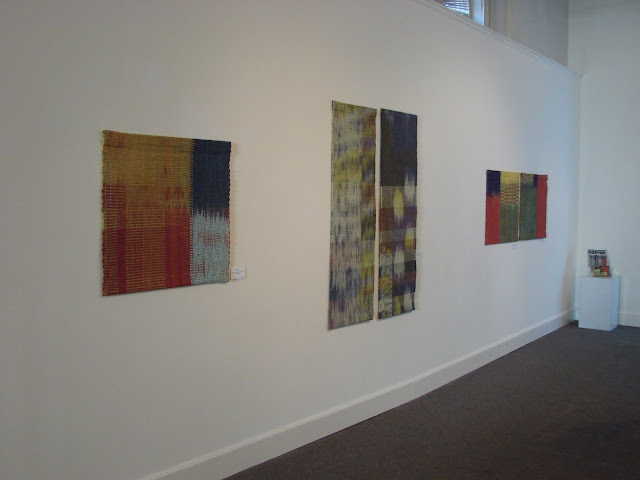 I received a BFA from the University of Michigan and an MFA in Textile Design from the University of Kansas. 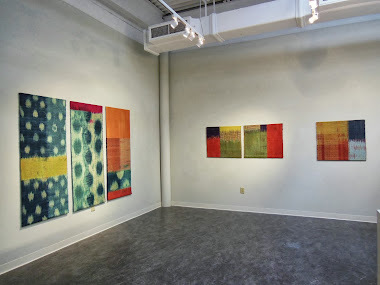 I teach color theory and I am gallery director at Meredith College in Raleigh, NC. 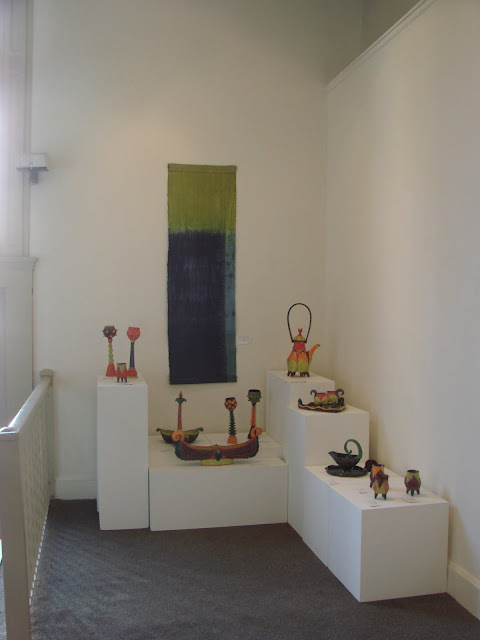 My work has been shown in local and regional solo, invitational and juried exhibitions. 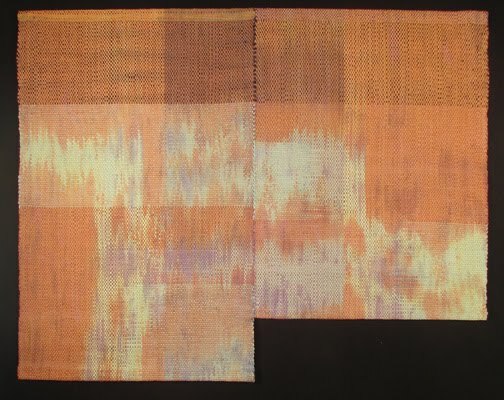 PROCESS For the warp (lengthwise elements), I start with white cotton fabric and use the Japanese shibori technique of folding, scrunching, binding and/or clamping the fabric before dyeing it in consecutive dye baths. 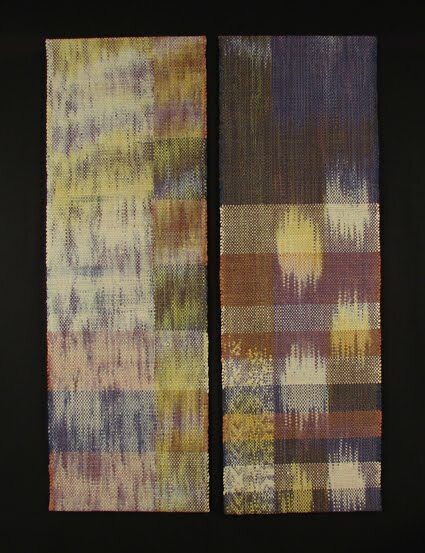 It is then stripped into ½” widths and threaded on the loom. 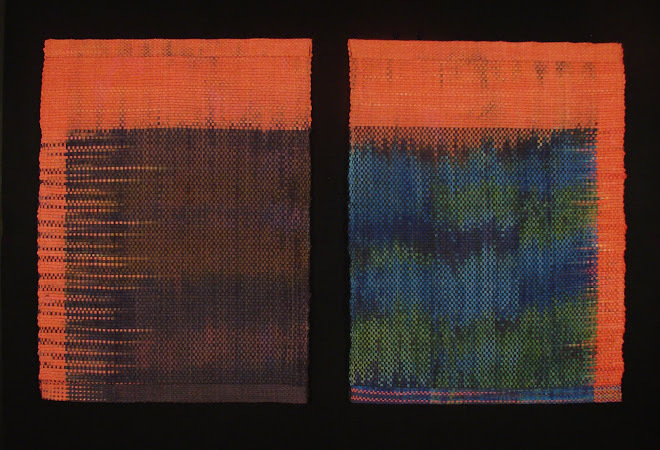 The weft (crosswise elements) is more intentionally planned using the ikat method of grouping 1” wide strips and binding off specific color areas before the dyeing progression. 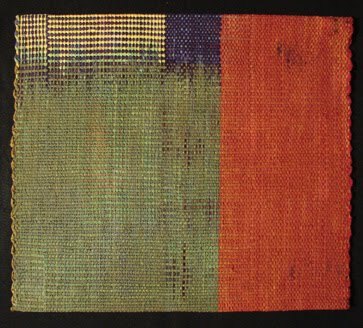 Sometimes precisely calculated, sometimes left more to chance, colors meet and/or overlap as the over, under, over, under of the weaving process progresses. 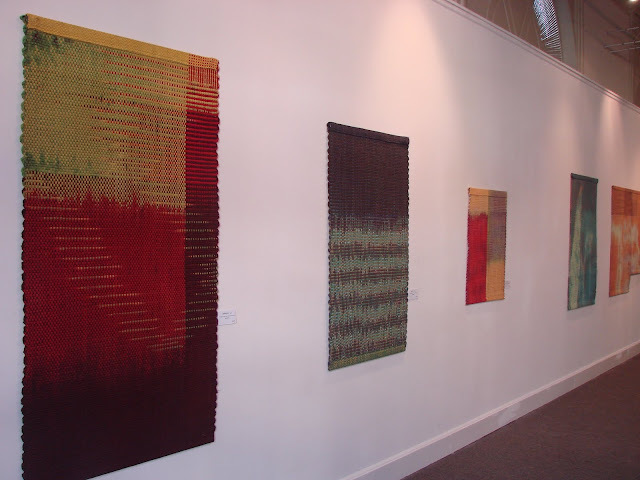 HANGING METHOD Velcro secures the weavings to a flat strip of wood which is mounted on the wall. 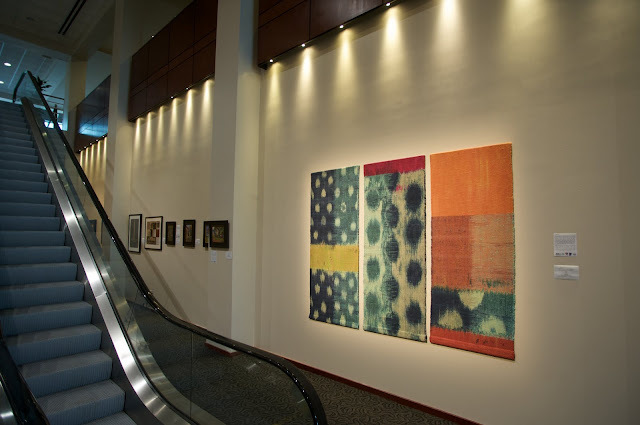 CARE Fiber reactive dyes, which chemically bond the pigment and cloth, are used. 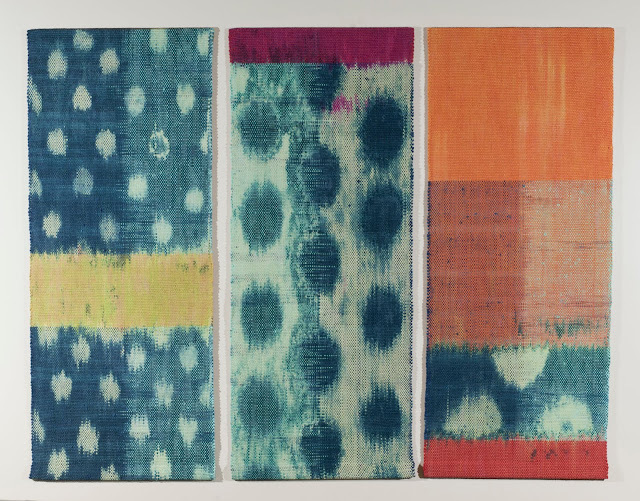 These dyes are more fade-resistant than other dyes, but, as with any textiles, direct light should be avoided. 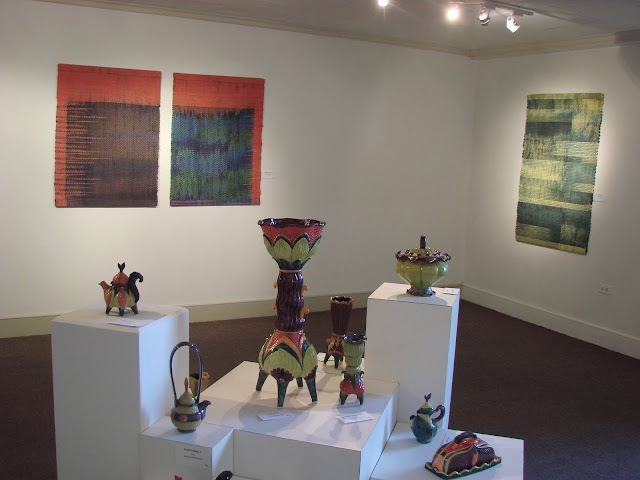 To clean, remove from the wall and shake out the dust, or vacuum with low suction. 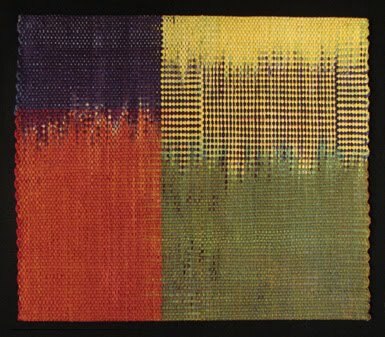 RÉSUMÉ Please request via email.